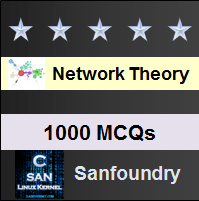 This set of Network Theory Multiple Choice Questions & Answers (MCQs) focuses on “Properties of Transfer Functions”. 1. The coefficients of numerator polynomial and the denominator polynomial in a transfer function must be? Explanation: The coefficients of P(s), the numerator polynomial and of Q(s), the denominator polynomial in a transfer function must be real. Therefore all poles and zeros if complex must occur in conjugate pairs. 2. In a transfer function, the degree of numerator polynomial is ___________ than the degree of the denominator polynomial. Explanation: In a transfer function, the degree of numerator polynomial is less than or equal to than the degree of the denominator polynomial. And the degree of the numerator polynomial of Z21(s) or Y21(s) is less than or equal to the degree of the denominator polynomial plus one. 3. The real parts of all poles and zeros in a driving point function must be? Explanation: The real parts of all poles and zeros in a driving point function must be zero or negative but should not be positive and the complex or imaginary poles and zeros must occur in conjugate pairs. 4. If the real part of driving point function is zero, then the pole and zero must be? Explanation: If the real part of driving point function is zero, then the pole and zero must be simple but should not contain any complex pole or complex zero. 5. The degree of the numerator polynomial and denominator polynomial in a driving point function may differ by? Explanation: The degree of numerator polynomial and denominator polynomial in a driving point function may differ by zero or one. And the polynomials P(s) and Q(s) may not have any missing terms between the highest and lowest degrees unless all even or odd terms are missing. Explanation: The lowest degree in numerator polynomial and denominator polynomial in a driving point function may differ by at most one and the coefficients in the polynomials P(s) and Q(s) of network function must be real and positive. 7. The coefficients in the denominator polynomial of the transfer function must be? Explanation: The coefficients in the denominator polynomial of the transfer function must be positive but should not be negative and the coefficients in the polynomials P(s) and Q(s) of transfer function must be real. 8. The coefficients in the numerator polynomial of the transfer function may be? Explanation: The coefficients in the numerator polynomial of the transfer function may be negative and the complex or imaginary poles and zeros must occur in conjugate pairs. 9. The denominator polynomial in a transfer function may not have any missing terms between the highest and the lowest degree, unless? Explanation: The denominator polynomial in a transfer function may not have any missing terms between the highest and the lowest degree, unless all even or odd terms are missing and the polynomial P(s) may have missing terms between the lowest and the highest degree. 10. The degree of numerator polynomial in a transfer function may be as small as _________ independent of the degree of the denominator polynomial. Explanation: The degree of numerator polynomial in a transfer function may be as small as zero, independent of the degree of the denominator polynomial and for the voltage transfer ratio and the current transfer ratio, the maximum degree of P(s) must be equal to the degree of Q(s).